It’s been a few years since I have reviewed an Accell product, and I am back to reviewing the Powramid once again. This is the Powramid Air Power Center and USB Charging Station, and it is a sequel better than the original. I believe that the original was called the Powramid because its shape resembled a pyramid. I believe that worked well because you know how certain plug-ins are big these days? However, the new Powramid Air is more of a discus. It is not totally flat, but it can hold a lot of big plug-ins (six), as well as two USB ports. There is a six-foot power cord, and a scratch-resistant base. There is an odd on-off power button like right in the middle. I hope that won’t get triggered by accident and shut off the whole thing. 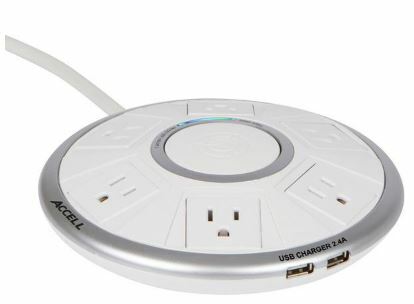 So if you are looking for a surge protector that is pretty good with 1080 Joules of surge protection, then head on over to the Accell Cables site and get the Powramid Air in white or black.